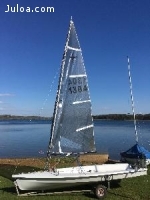 Held over the Bank Holiday weekend and forming a part of the 125th Burnham Week Regatta the event attracted a competitive fleet of 12 boats eager to hone their skills prior to the National Championships at Highcliffe in two weeks time. The weather looked unusually benign for Burnham Week which is more commonly associated with arduous courses raced over in 20+ knot winds. In fact Saturday dawned bright and calm - so calm that the river was mirror flat- with only an occasional zephyr to be seen. 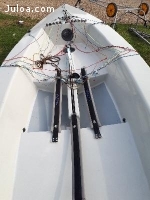 With a flooding tide an immediate postponement was no surprise and the fleet resorted to their favourite activity with tape measures and rig tension gauges to perfect and record settings. As the morning passed it became obvious that racing was going to be unlikely if not and the fleet accordingly requested the Race Officer to abandon any racing for the day. Sunday morning was slightly overcast but still warm and another delayed start seemed likely as was indeed the case. The sea breeze did however develop and racing was on. The starts for all fleets were expertly run by Edwin Buckley and his team from their committee boat moored off Pile House with start lines to either side for the dinghy and day boat fleets. The course was the usual epic associated with this event with no less than two legs up and down the River Roach and a further final downriver beat against the tide to Holliwell. The fleet started in close company on the short start line and short tacked up the north bank to find Greenward for the first leg across the river into the River Roach. Wayling had pulled ahead of the fleet whilst the following group of Roberts, Miller, Orman and Portway battled it out. Having worked to the front of this group Roberts judged his layline to Greenward finely and managed to round ahead of Wayling who had over stood the mark slightly. These two subsequently pulled ahead of the fleet and a two hour chase saw unrelenting pressure from Wayling fail to catch Roberts as the marathon course was completed. A second race proved impossible as the race finished at 5:30pm with an exhausted fleet retreating to cocktails at the Royal Corinthian. Monday provided more settled conditions and two races seemed more likely to be possible. A request had been made for shorter courses and a simpler windward/leeward course was proposed. This did however entail three beats against the flooding tide and would prove to give challenging tactical decisions as the day progressed. The first race of the day saw Roberts late for the start whilst the leading group of Wayling, Orman and House battle it out. 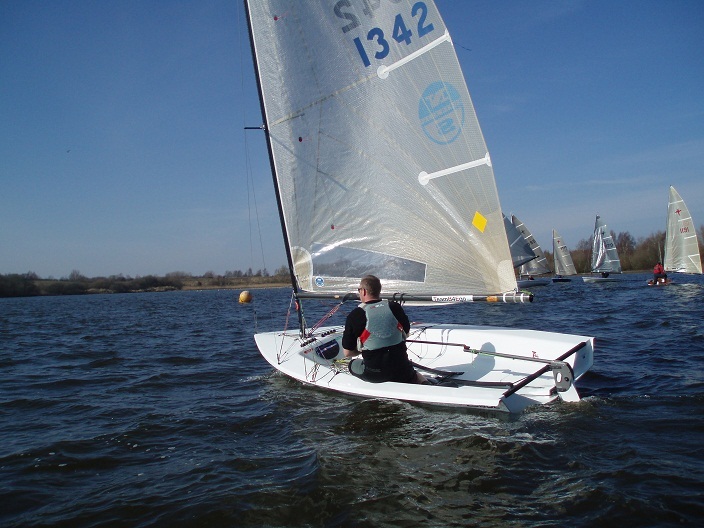 Local sailor Graham Dale-Jones showed well with a bolder course exploiting the weaker tide toward the north bank and as the tide grew in strength subsequent upwind legs had the fleet short tacking up the south bank. Roberts ignored the fleet on the final beat by taking an alternative course on rounding the leeward mark and tacking immediately for the north shore and the sanctuary of shallow water and a weaker tide. Doubly rewarded by a swing in the sea breeze upon tacking to cross the tide to seaward of the mouth of the River Roach he crossed ahead of Wayling and Dale-Jones to round the final mark and run with the tide to the finish. The final race saw a reduction in entry as the weekend and the long courses took their toll but Wayling, Roberts and Portway battled it out at the front of the fleet short tacking up the north bank from the start. Wayling kept his cool under pressure and took the win ahead of Roberts and Portway. The event was won by Roberts with two wins ahead of Wayling and Portway. A good showing was seen from the local Creeksea fleet in the following three places. At the prizegiving Roberts acknowledged the contribution of the late John Torrance in initially sourcing the Trophy and creating the event. All competitors were delighted to also receive a set of suitably engraved drinking glasses from the Burnham Week combined clubs.